Patients can now benefit from modern reconstructive surgery techniques and orbital implant materials to gain the best possible cosmetic results. This is highly specialised surgery involving every aspect of the Oculoplastic Surgeon’s expertise. It calls for skill and attention to detail. It also requires close collaboration with a skilled and experienced ocularist, whose role is to manufactures and fit the artificial eye. This refers to an operation to remove the entire eyeball. The muscles are detached from the eyeball to enable this to be undertaken. This surgery would be required if the eye contained a tumour e.g. a choroidal melanoma. This refers to an operation in which only the contents of the eye are removed, along with the cornea, leaving the sclera, the thick white coat of the eye, and the attached eye muscles intact. There are pros and cons to each procedure, which depend on the patient’s individual history and examination findings. Note: an ocular prosthesis refers to an artificial eye, which is made to mimic an eye as much as possible – an orbital implant is a device which is inserted into the eye socket surgically and which is not normally visible but is buried beneath the surface tissues of the socket. Many patients who have lost an eye have a condition referred to as the post enucleation socket syndrome (often abbreviated to ‘PESS’). Many of these features are amenable to surgical improvement. The surgery may have to be carried out in stages. A patient undergoing this type of surgery may have to accept a lengthy period of time (2-3 months) without the ocular prosthesis (artificial eye) during the recovery phase. Such surgery can have a significant effect on a patient professionally, socially and emotionally. My name is Marzena. I am Polish. I would like to share my son’s story. Jan had a very unfortunate accident at the age of 18 months. During a routine walk he fell down and a thorn of a rose badly injured his right eye. It was a very serious penetrating injury due to which he lost completely his eye sight in his right eye. Jan’s artificial eye looks and moves like a real eye. We are extremely happy with the final results of the surgery and the artificial eye work. I cannot even find words to express our gratitude to the wonderful specialists and their gifted hands who changed Jan’s appearance. 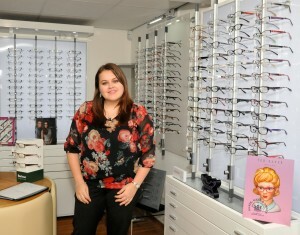 In 2003 I went for a routine eye check at my opticians – my husband and I were living in Germany at the time. The optician detected an abnormality and referred me to my GP, who after examination subsequently referred me to an ophthalmologist. The ophthalmologist diagnosed a detached retina in my left eye. In order to try to rectify the detachment I embarked on a series of operations. The attempts to re-attach the retina took place over 5 years and included several surgical procedures – some under general anaesthetic and others under local including laser. The operations were unsuccessful and at the end of the 5 year period I was left with only 5% peripheral vision in my left eye. As time passed my sensitivity to light increased to an unacceptable level and the affected eye was permanently sore. To mitigate I took to wearing a combination of sunglasses, baseball caps and a variety of contact lenses – not all at the same time I hasten to add. Comfort drops were ineffective and increased the degree of soreness due in the main to the preservative they contained. The area around the eye darkened and appeared hollow, an imperceptible change that went un-noticed day to day. 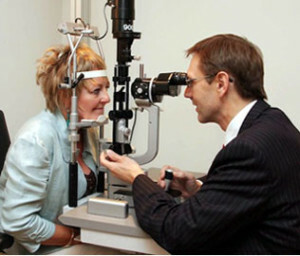 We returned to the UK in 2010 and my GP referred me to hospital for a traumatic glaucoma. Treatment involved eye drops to control the intraocular pressure. Light sensitivity increased as did the soreness. I was unable to enjoy evening social events and became more and more miserable with my situation. Enough was enough and after a full and frank discussion with my husband we took the decision to explore the possibility of having the affected eye removed and replaced with a prosthetic. Initially I contacted Robin Brammar and both he and his wife Julie could not have been more helpful and understanding. We discussed in great detail what the procedure would entail and I was reassured. During our conversations they mentioned that a consultant eye surgeon, Brian Leatherbarrow, would be able to help further and I took the opportunity to research some of his case histories online. The upshot was that I visited my GP and asked to be referred to Brian as a private patient. An appointment was arranged. My husband and I met Brian at his practice in Manchester and he spent an hour explaining in great detail the pros and cons of my condition, surgery options open to us and post op care. I was not suitable for a porous implant because of the multiple operations I had undergone and it was decided that a dermis fat graft would be preferable in my case. I was left in no doubt as to what I could expect and also understood that the entire process was likely to take up to 4 months to complete including the fitting for and manufacture of a bespoke prosthesis. After returning home a letter from Brian arrived summarising our discussions and offering potential start dates. We opted for 1 February 2017. The day before the operation my husband and I travelled to Manchester and checked in to our hotel. Tony wanted to be with me throughout. The following day we travelled to the Manchester Eye Hospital and made our way to the private patient eye ward. The registration procedure was calm, relaxed, thorough and professional. 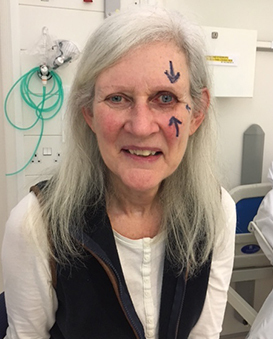 Brian arrived and drew arrows on my face and forehead indicating the correct eye to undergo surgery and discussed the site for the donor fat graft – my left hip. For me this was vitally important for 2 reasons. Firstly, the fat was to be used to form the filling for my empty eye socket, attaching the 4 main eye control muscles and form the base for the intended prosthetic. Secondly, being tall and slim, there really weren’t that many options open to us and I wanted to make sure that the chosen site would provide enough stuffing so to speak. Brian’s manner was such that I was left feeling even more confident than before if a little apprehensive, mostly about going under general anaesthetic. After Brian left to start his list the anaesthetist, Dev, visited me and he too took great pains to ensure that as far as practicably possible, I was fit and ready to undergo the planned surgical procedure. Number two on Brian’s list, I walked to the anaesthetist’s room, met Dev and had the intravenous infusion inserted into my arm and a blood pressure cuff fitted. Counting down from 10, I drifted off. After the operation I recovered consciousness and was transported back to my room and made comfortable. Although feeling peckish I’m afraid the nausea brought on by the anaesthetic made me feel sick and dampened my appetite. The nurses were keen to get me to eat something and spent time trying to tempt me. A little later that evening I ate a biscuit, sipped apple juice and started to feel much better. Throughout the night the nurses checked me for pain every two hours but I must admit that I did not suffer from any post op pain caused by the surgery – nothing at all. My head was bandaged as was my left eye. The following morning Tony arrived early and later that day my sister, niece and grandniece joined us. I wasn’t particularly chatty but my grandniece, Sophie, made up for that carrying on a three way conversation between herself, me and her dollies. On the second night I slept reasonably well but of course my sleep was disturbed by the essential two hourly checks. Still no pain but the anti-inflammatories and anti-biotics had to be administered. I also took an anti-emetic to curb what was left of the nausea. Anyway – all that aside, we had the first chance to peep under the bandage to inspect Brian’s handiwork. The nurse removed first the bandage and then, very carefully, the eye dressing. The eye socket was stitched closed, silicone bolsters used to protect the stitches from tearing my eyelid and a conformer was fitted. It all felt fine if a bit gooey! The rest of the day I picked up speed and apart from feeling tired through lack of sleep, was getting back to my old self – still no pain. The next morning Brian re-visited and gave me the all clear to go home – hurray! Tony and I took a taxi to the station and caught our train back to Malton. I slept most of the way and the train journey passed quickly. A drive on to the moors and we were home. It was lovely to see my two gorgeous dogs again. Part of Brian’s pre-discharge talk was advice about not bending down and picking up heavy objects – that sort of thing. Not to worry as Tony did everything for me and I felt much pampered. Even the dogs were gentle – not the usual behaviour for our two big bouncy chocolate labs. On Valentine’s Day we returned to see Brian at his clinic to have the stitches removed. The process was a little uncomfortable but only for a short period of time. Brian was pleased with the progress and advised we continue using anti-biotic ointment to help keep the site free from any infection. The conformer – a large(ish) opaque plastic contact lens – continued to protect the eye. A month later on the 14 March a second visit found a few shards of undissolved stitch which Brian removed having applied a local anaesthetic. A little swelling was still obvious and Brian advised we wait until later in May before fitting the prosthesis under Robin Brammar. Not a problem – this was only going to happen once so conditions had to be right. We had a holiday booked in May so having checked in to our hotel at Manchester Airport we got a cab to Wilmslow to see Robin at his practice. Robin and Julie could not have been more welcoming and it was exciting to be moving on to the next stage of the proceedings. Robin explained in great detail exactly what was going to happen over the next few weeks. Having removed the conformer Robin took an impression of the surface of my eye by inserting a small inverted funnel and filling it with a liquid. I was warned that it would feel cold but the process was painless, just a little uncomfortable. After the liquid set the funnel was removed along with some extra small shards of undissolved stitch. Having cleaned the site of remaining wax Robin replaced my conformer. Everything was a lot more comfortable due in the main to my eye lid being able to move far more smoothly across the conformer. Robin then proceeded to set up his palette and brushes at his easel and to my amazement started to paint, very carefully, the surface of what was to be my new eye. The painting process was carried out through a droplet of water – I had never heard of or seen such a thing before. It was all so precise and the scale so small. Expert work no doubt. I was sat in very good natural light and Robin would stop from time to time to bring his work over to me to compare it with my good eye, getting as near to a perfect colour match as he could. The painting process took about an hour to complete but the time shot by. After painting Robin matched the white of my good eye with a sample from what could be described as a swatch of examples. He went on to explain that he would make the prosthesis from the wax impression out of high end Perspex. Perspex being the material of choice following pioneering work carried out when during the second world war the eyes of wounded Spitfire pilots, having had shards of the airplane’s Perspex windscreens lodged in them, did not reject the Perspex – astonishing. Anyway, we said our farewells and went on holiday. We returned to see Robin on 1 June for a fitting – at first just the white and after some minor alterations to smooth the finished item Robin fitted the coloured part and refitted the complete eye. I was thrilled to see myself with both eyes after such a long time. The prosthesis appeared darker than it would after the next phase which would include adding blood vessels and a covering that brings out the colour of the eye. Robin did a lot of polishing, smoothing and re-fitting until I was completely happy with the fit. In the end it felt great. A week later found us back with both Robin and Brian for the final fit. This was really exciting and I had been looking forward to the appointment so much. Robin fitted the eye and I have to say the effect was quite fantastic. After a few minor polishes and adjustments the balance, shape, colours and fit were perfect. I couldn’t believe how good I looked and couldn’t stop grinning. Still can’t actually when I think back. Brian was thrilled with the end result and the fact that choosing to go with the fat graft had been just the right thing to do. I am thrilled. Since the prosthesis was fitted my surrounding eye has returned to its natural colour and plumped out again. The symmetry of my eyes is almost perfect and the muscle control of the prosthesis works really well. Personally I am far more confident than I had been before the op and have been able to experiment with new make ups, eyebrows and eyelashes – all very important stuff for a girl and I will always owe Brian and Robin a debt of gratitude. I am back to looking good, confident, enjoy an evening social life and best of all, am pain free. Four months well spent. Patients who present with a typical post enucleation socket syndrome (PESS) may benefit from secondary orbital implant surgery, but this surgical procedure is more difficult to undertake and the results are less predictable than primary orbital implantation undertaken at the time of an enucleation or evisceration. Patients undergoing secondary orbital implantation are more likely to require additional surgical procedures to gain the best cosmetic result. Although the volume deficiency improves following surgery, there is commonly a variable recurrence of the upper lid sulcus defect some months following surgery once all postoperative swelling has completely resolved. The “baseball implant” is of use in older patients who do not wish to take advantage of the second stage placement of a motility peg. The implant, made of acrylic, can improve a volume deficiency but the artificial eye movement results are quite unpredictable. If the degree of movement of the implant is good but that of the overlying ocular prosthesis poor, this has to be accepted as it cannot be improved surgically. One of the modern porous implants e.g. the hydroyxapatite implant or the bioceramic implant, is ideally reserved for a patient who would wish to undergo a second stage placement of a motility peg if the movement of the artificial eye were poor in spite of acceptable movement of the implant itself. This type of implant is ideal for the patient who has an old extruding or tilted orbital implant in place. An implant exchange is performed in the absence of any socket infection. The use of this type of implant is ill advised, however, following prior radiotherapy, in the presence of conjunctival inflammation or socket contracture, or for the reconstruction of a badly disorganised socket. The dermis fat graft (which is taken from the lower outer abdominal wall or upper outer quadrant of the buttock) is preferred for the reconstruction of the socket that has mild to moderate contracture in addition to a volume deficiency. It is the implant of choice for the reconstruction of badly disorganised sockets, and when complications have necessitated the removal of a porous implant or an infected/extruding synthetic implant. This type of surgery is usually performed under general anaesthesia with a 2 night stay in hospital as it can be associated with postoperative pain and nausea which need to be controlled with medications. Although there are a number of implant options porous polyethylene (Medpor) is the preferred implant of choice for subperiosteal placement. This synthetic implant is porous allowing fibrovascular ingrowth. It is malleable, and easy to shape and insert along the lateral and infero-lateral orbital wall through a smalll skin incision in a laughter line at the outer aspect of the eyelids. The placement of a subperiosteal implant can be combined with a lateral tarsal strip procedure (a lid tightening procedure) where there is lower lid laxity. This procedure can be performed under general anaesthesia or under local anaesthesia with intravenous sedation (“twilight anaesthesia”). This procedure can be undertaken on a day case basis but most patients stay in hospital for one night. If the orbital volume deficit is to be addressed with the use of a subperiosteal implant, a patient must be aware that a new ocular prosthesis may be needed. The intermittent injection of a hyaluronic acid dermal filler (Restylane Sub-Q) into the orbital apex is a relatively quick and simple procedure. The dermal filler is injected along the posterolateral orbital wall and the effect of the injection on the upper lid sulcus is observed. The treatment is, however, expensive and lasts only for 9-12 months before a repeat injection is required. For this reason, it is not a practical solution for most patients but it can be undertaken on a trial basis to see the effect before considering a more definitive procedure as described above. A contralateral blepharoplasty may be performed to provide a more symmetrical appearance in a patient who has an upper lid sulcus deformity (hollowed upper eyelid) but who does not wish to undergo a subperiosteal implant procedure. A patient must, however, appreciate the small risks involved in such surgery performed around an only eye. A small dermis fat graft can be inserted into the upper lid sulcus after exposing the orbital roof via a skin crease incision. The dermis is sutured to the periosteum of the orbital roof while the fat is placed in such a position as to mimic the preaponeurotic fat. The dermis fat graft is oversized to allow for some postoperative absorption. This type of graft does tend to create a rather bulky appearance to the upper eyelid, however. 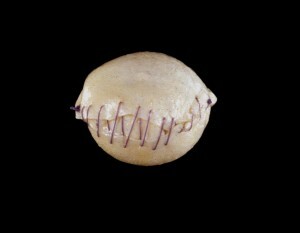 Individual fat pearls can be harvested from the peri-umbilical area (the area around the tummy button) and placed directly into the upper eyelid hollowing via an upper lid skin crease incision. This can yield a good result, but the degree of postoperative fat atrophy is unpredictable. 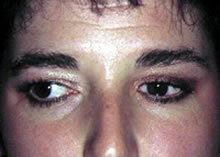 Some patients require blepharoptosis surgery. For the vast majority the procedure undertaken is a posterior approach Muller’s muscle resection, with no visible scar as the incision is made on the inside of the upper eyelid. This is usually undertaken under “twilight anaesthesia” on a day case basis. What is an hydroxyapatite orbital implant? Porous hydroxyapatite is a complex calcium phosphate salt, made from coral, which is similar to human cancellous (spongy) bone with interconnecting tunnels and no dead-ends. When implanted into the eye socket, porous hydroxyapatite is not treated as a foreign substance by the body in contrast to most other implants used in the past, but becomes ingrown with blood vessels and tissue. As a result of this integration with the orbital tissues, the implant resists migration and rejection. The porous hydroxyapatite implant can be directly coupled with the artificial eye some months after insertion to improve movement by means of a small peg. This fits into a hole drilled through the conjunctiva (the pink membrane which lines the socket) and into the buried implant. The conjunctiva then grows down the sides of this drilled hole. This occurs because the implant by then contains blood vessels that support growth of this tissue. This secondary procedure is, however, only undertaken for patients in whom the degree of movement of the artificial eye is deemed unsatisfactory following the first stage. Nowadays the second stage is rarely undertaken as it can be associated with minor problems, which require further surgery.Porous orbital implants have now become the implants of first choice amongst the leading oculoplastic surgeons world-wide. Mr Leatherbarrow first implanted an hydroxyapatite orbital implant in Manchester in 1992. By February 2017 over 1500 patients had received this implant under his care in Manchester. Under what circumstances is this implant used? At the time of enucleation or evisceration (removal of the eye). This is known as a primary orbital implant. For those patients without an implant in their socket. This is known as a secondary orbital implant when no implant was previously placed in the eye socket. Or as an exchange implant for those patients dissatisfied with the movement of their artificial eye or whose implant has moved causing fitting problems of the artificial eye. It may also be used as an exchange implant for the patient with an old fashioned implant which is coming out (extruding). Are there any disadvantages associated with this implant? The additional costs involved, namely the cost of the implant, the requirement and expense of the 2nd stage drilling procedure (if this is deemed necessary for the individual patient), and the required modifications to the artificial eye. Are there any contraindications to the use of this implant? Although there are no specific contraindications to the use of this implant, some patients are not suitable for implantation due to severe contracture of the socket tissue due to previous serious infections, trauma, or the use of radiotherapy (X-ray treatment). A simple examination of the socket and eyelids can determine your suitability for this procedure. An alternative procedure for such patients is the use of a dermis fat graft, which is taken from the lower abdominal wall or the upper outer quadrant of the buttock. 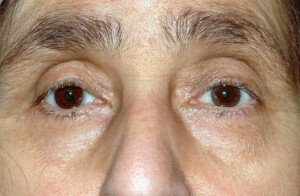 A patient who has undergone a left secondary hydroxyapatite orbital implant procedure with placement of a motility peg. This patient has had her implant and motility peg for over 20 years. How good are the results of this procedure? The results of primary implantation tend to be very good. The results of secondary implantation are less predictable as the socket anatomy has been disrupted and the eye muscles are retracted, scarred and difficult to locate at the time of surgery. In experienced hands, however, the results are usually good but the degree of movement is variable from patient to patient. Might other surgical procedures be required? This is always a possibility. Sometimes the size of implant used is insufficient to overcome a sunken appearance or hollow appearance in the upper eyelid. If the appearance is cosmetically unsatisfactory a second type of implant can be used. 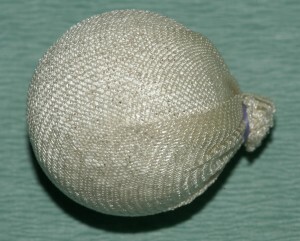 This is referred to as a subperiosteal implant and is placed beneath the lining of the bone at the outer aspect of the orbit through a small skin incision in the laughter lines at the outer corner of the eye under general anaesthesia or under local anaesthesia with sedation (“twilight anaesthesia”). Approximately 5-10% of patients require this. The implant most commonly used for this is Medpor (porous polyethylene). Another alternative is the injection of small expandable pellet implants via a small “stab” incision in the conjunctiva behind the lower eyelid. These expand to 4 times their injected size and provide additional socket volume. For some patients, Restylane sub-Q, a dermal filler, can be injected into the orbit to add volume. Eyelid surgery to deal with a droop to the upper eyelid (a blepharoptosis) is occasionally required under local anaesthesia with sedation (“twilight anaesthesia”) on a day case basis at a later date. This procedure can also be performed under general anaesthesia for the very anxious patient. 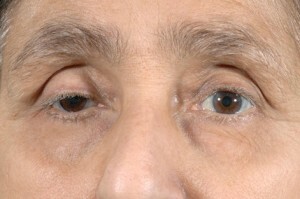 A blepharoptosis is most often managed by means of a Müller’s muscle resection procedure which is undertaken via an incision on the inside of the upper eyelid, avoiding a visible external scar. The advantage of this approach is that it has a minimal effect on the reflex blink of the upper eyelid over the artificial eye following the surgery. The height and contour of the eyelid are also more adjustable with the use of postoperative massage. The ocularist can also make adjustments to the artificial eye to gain the best possible cosmetic result. A surgical conformer is placed in the socket and the artificial eye is not worn for 2 weeks. For patients with a greater degree of blepharoptosis, a skin incision is made through the upper lid skin crease and a levator aponeurosis advancement procedure is undertaken. This is usually undertaken under local anaesthesia with sedation (“twilight anaesthesia”) as the patient’s co-operation is required during the surgery to gain the best height and contour of the upper eyelid. 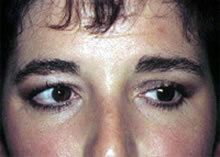 Eyelid surgery to deal with laxity of the lower eyelid is more commonly required. The lower eyelid loses tone with age and the weight of an artificial eye further contributes to laxity and drooping of the lower eyelid. This varies from patient to patient. Patients are discouraged from removing and replacing the artificial eye and from rubbing the eye as this predisposes a patient to the development of a ptosis and lower eyelid laxity. Surgery to address a drooping lower eyelid may need to be performed on more than one occasion over the course of a patient’s lifetime. The eyelid is tightened by means of a lateral tarsal strip procedure which leaves a very small scar along a “laughter line” at the outer aspect of the eyelids. This is most commonly performed under local anaesthesia with or without sedation on a day case basis. The eyelid is deliberately over-tightened to allow for some postoperative tissue laxity as the swelling subsides. A surgical conformer is placed in the socket and the artificial eye is not refitted for a minimum period of 4 weeks (preferably 6 weeks) following the surgery to allow the wound to settle. If the artificial eye is fitted sooner than this there is a high risk of failure of the operation with a recurrence of the lower eyelid laxity. Patients who have a shallowing of their inferior (and/or superior) conjunctival fornix (the cul-de-sac behind the eyelid), a mucous membrane graft might need to be taken from the lower lip. This leaves a raw wound which heals spontaneously, usually over a period of 2-3 weeks. This is usually placed in conjunction with a silicone band on the inside of the eyelid and nylon sutures. This is usually left in place for a minimum period of 2 months. The band and sutures and then removed in clinic. During this time, a surgical conformer is worn. Are there any risks associated with this surgery? No operation is free from risk. There are risks common to all operations performed under general anaesthesia. The risks are kept to an absolute minimum e.g. the risk of postoperative infection is minimised by a strict aseptic surgical technique and by the use of intraoperative and postoperative antibiotics. Complications in the hands of a skilled and experienced oculoplastic surgeon are rare and can usually be managed with further surgery. Is it necessary to undergo the second stage drilling procedure? No. If a patient is happy with the results of the initial procedure the second stage drilling procedure may be omitted. Approximately only 1% of our patients now choose to proceed with the drilling procedure. Approximately 1 hr 30 mins. Few patients experience signficant pain after the first 48 hours although for some patients (approximately 1 in 10) the pain can be more severe and can last for a few days. Pain is usually controlled very well with simple analgesics but stronger ones can be provided. Pain is associated with movement of the normal eye and this can be avoided by simply moving your head instead of your eyes. For these reasons most patients stay in hospital for 2 nights following this surgery. The postoperative dressing should be worn for 2-3 days to reduce postoperative bruising and swelling. It is wise to advise your family and friends, including children, that you will be wearing a head bandage, and that when it is removed the eyelids may be quite bruised. You may remove your own dressing to save another journey to the hospital. You will be given written instructions on aftercare before you are discharged home. 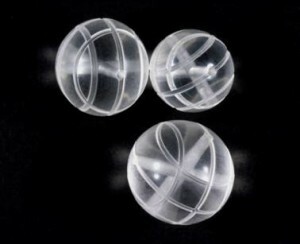 What is used to wrap the orbital implant? A porous orbital implant is usually wrapped in Vicryl mesh, which dissolves over the course of a few weeks. This is the same material that dissolvable sutures are made out of. This enables the eye muscles to be attached to the implant.For some patients, the sclera (the thick white outer coat of the eye) from the eye that is removed can be used. For some patients, particularly those at a higher risk of implant exposure, a patch graft is placed under the conjunctiva, the pink membrane of the socket. This can be temporalis fascia (taken via a small incision behind the hairline in the temple) or fascia lata (taken via a small incision in the outer thigh just above the knee). Temporalis fascia is used more commonly, and the wound is closed with staples which are removed 10 days post-operatively, usually at the same time that the temporary suture tarsorrhaphy is removed (see below). Usually you will be admitted on the day of surgery and discharged home the following day. Occasionally a further night in hospital is required in the event of excessive sickness or pain. It is wise to plan for a 2 night stay if you have far to travel home. Medicines can be prescribed which can reduce feelings of nausea. This very much depends on your individual circumstances and the type of work you do. Most people take at least 2 weeks off after surgery. It is wise to take off more time if your work is not in a clean environment. You will be discharged home with a pressure dressing in place and a bandage around your head to keep bruising and swelling to a minimum. This should be kept in place for 2 days. When it is removed the eyelids may be quite bruised. Your eyelids will have been sewn together temporarily (a temporary suture tarsorrhaphy) with a blue nylon suture (stitch) which is tied over small clear silicone or red rubber bolsters. This is to prevent any prolapse of swollen tissue between the eyelids. The suture is removed at the first postoperative visit 2 weeks after the surgery.The appearance of the socket can be camouflaged with dark glasses or bespoke spectacles can be made for you by my optometry colleague, Becky Rietdyke at our in-house optometry practice, Eye2C Optometry. A temporary eye pad may be applied to go home with but this should not be worn continuously. Initially the upper lid will be droopy due to swelling but this will begin to rise within a few days.How long will it be before I get my new artificial eye?The socket has to heal fully before a new artificial eye is fitted. This usually takes a minimum of 8 weeks. If all is well after surgery your ocularist may proceed with fitting arrangements. Please take note that the time this process takes may be longer depending on your own postoperative progress and the availability of the ocularist. At 2-3 weeks after surgery a visit may be required for a surgical conformer to be fitted by your ocularist. This is like an artificial eye but it is made of clear plastic with 2 drainage holes. This is inserted into the socket to prevent shrinkage. A conformer may have been fitted in the operating theatre but the ocularist may exchange this for another as the shape of the socket can change with postoperative swelling. How is a second stage drilling procedure performed? This is performed in the operating theatre under local anaesthesia with sedation or under general anaesthesia on a day case basis. A few days before the drilling procedure, a wax template is made by your ocularist with a hole in the desired position of the motility peg. This is used to mark the surface of the implant to ensure that the drill hole is made in the best possible position. The drilling takes a few minutes to perform but the whole procedure, taking into account preparation time, make take approximately 30 minutes. A temporary peg with a flat head is inserted into the hole and the artificial eye is replaced in the socket. The artificial eye will not fit correctly until adjusted. You should take note of this as it will affect your appearance until the necessary modifications have been made later. 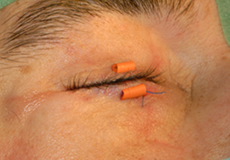 A permanent round headed peg is then placed and the back of the artificial eye modified to accept the head of the peg (see above). This will be made by your ocularist, Mr Robin Brammar. An impression is obtained of your socket by introducing cream which will set to a very soft, rubbery consistency and will record the shape of your socket. A painting to match your remaining eye is usually made at this stage. This is competed in your presence to obtain the best possible colour match. This appointment usually lasts one hour. A wax pattern will by now have been produced to fit the plaster model resulting from the impression of your socket obtained during your first appointment. This wax pattern will be tried in the socket and modified by careful sculpturing until an ideal compromise between fit, comfort, mobility, lid-line and contour is achieved. Lastly, the iris/cornea unit is positioned to match the remaining natural eye. This appointment will take about one hour. This is usually a simple matter of collecting your artificial eye prosthesis. There may be some minor adjustments necessary. Your artificial eye need only be cleaned occasionally. You may sleep with your artificial eye in, in fact it is advisable to do so. However, when it is removed, it should be cleaned by using hard contact lens cleaner, as the most common problem is irritation and watering caused by a protein build up. If not cleaned correctly this protein will collect upon the surface of the artificial eye as a crystalline coating which will eventually make the artificial eye feel gritty. The socket lining and the inner surface of the eyelids may become inflamed and sore with discharge in extreme cases. You are advised to return annually for a check up when any small fitting changes will be assessed and your artificial eye will be re-polished to remove deposits and any scratches. You will be advised when your prosthesis needs to be replaced. This can be required every two to five years but this time-scale varies considerably from patient to patient. If you can, try to stop smoking at least six to eight weeks prior to surgery. Smoking has an adverse effect on healing, and affects your recovery from general anaesthesia. Your vision in your eye is measured. Your eye is examined carefully using a slit lamp (a special ophthalmic microscope). If you have had general anaesthesia you will be returned to the ward usually after a period of up to 30 minutes in the recovery room. Your usual medications may be continued. Resume aspirin, blood thinners, and arthritis medications 48 hours after surgery unless otherwise instructed. You may experience difficulty wearing your glasses because of the dressings. If a mucous membrane graft was taken from your lower lip use Difflam mouthwash 4-5 times a day and eat a soft diet. Avoid hot drinks for at least 2 weeks. You will be given antibiotics to take postoperatively, usually Augmentin 375mg 3 times a day or Cephalexin 500mg twice a day (or Erythromycin if you are allergic to Penicillin) for 7 days. Please ensure that you complete the course and do not omit a dose. Sometimes a different oral antibiotic is prescribed. You will also be given a 2 week course of anti-inflammatory tablets, Indomethacin 100mg 3 times a day. You should not take these if you have a history of stomach ulcer problems or if you experience heartburn. These should be taken with food. They also act as a painkiller. You may also be prescribed Kapeke tablets to take home. These are quite strong painkillers and can make you constipated. If simple analgesics are sufficient e.g.Cocodamol, use these instead. Apply antibiotic ointment three times a day to the edges of the eyelids and the bolsters for 2 weeks after the dressings have been removed. Use sterile cotton wool balls and saline to keep the eyelids clean of any discharge 2-3 times a day. This will be changed to antibiotic eye drops as soon as the temporary stitch has been removed. The stitches used to close the wound in the socket are absorbable and will drop out in 3-4 weeks. A realistic period of recovery must be expected. Postoperative bruising usually takes at least 2-3 weeks to subside completely. Swelling takes much longer. Most of the swelling disappears after 3-4 weeks but this can vary considerably from patient to patient as does the extent of the swelling. The final result is not seen for at least 3-4 months. This should be taken into consideration when scheduling the operation. You should arrange this surgery after holiday periods or important professional or social events and not before so that you are available for postoperative review and just in case any surgical adjustments are required.Mrs Rebecca Rietdyke (Becky), Mr Leatherbarrow’s specialist optometrist colleague at Eye2C Optometry, whose practice is within Mr Leatherbarrow’s clinic, can assist with the fitting of bespoke camouflage spectacles and protective eye wear (this is very important), and for those patients with an unsightly but non-painful eye, she can fit a cosmetic contact lens. To learn more about Enucleation/Evisceration/ Orbital Implant Surgery, please contact us at today to schedule an appointment.